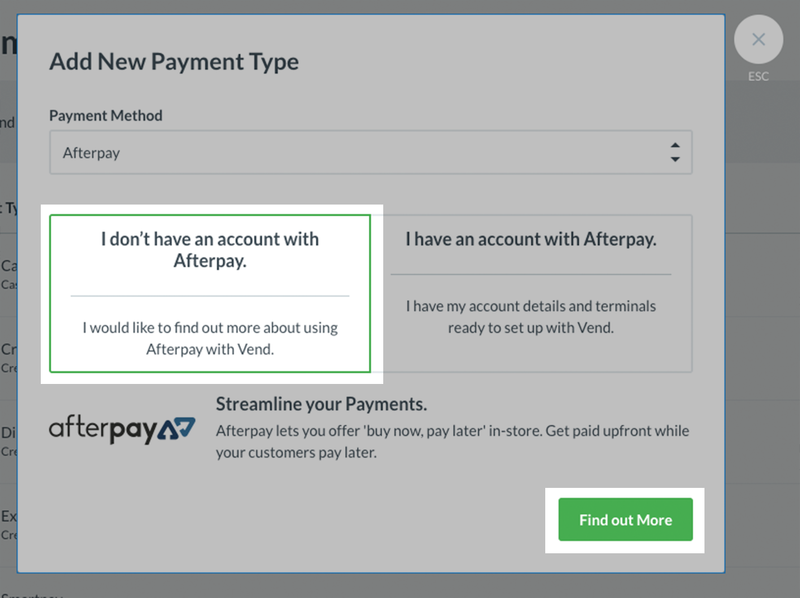 Taking Payments with Afterpay and Vend – How can we help? 1. First, Login to your admin user account for your Vend store on a Mac or PC. 2. Next, navigate to Setup -> Payment Types and click the 'Add Payment Type' button. 3. Once here, select Afterpay from the payment type dropdown. 4. If you do not yet have an Afterpay account, click "I don't have an Afterpay account" to learn more about getting started. 5. If you've already got your Afterpay account, select "I have an Afterpay account" and click the Pair Register button that appears below. 6. 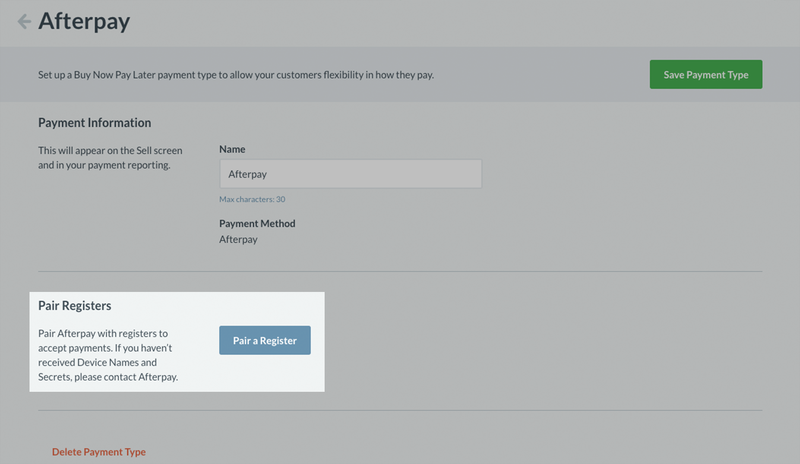 This will create the Afterpay payment type and bring up the pairing window so that you can connect your Afterpay account to one of your Vend registers. Here you will need to choose the Register you'd like to link to, and enter the Afterpay Merchant ID, Device Name and device Secret that Afterpay have provided you. What is the Afterpay Merchant ID, Device Name and Device Secret? Afterpay "devices" refer to specific credentials that Afterpay will provide you when setting up Afterpay with Vend. The Merchant ID, Device Name and Secret are all credentials which will enable you to link your Afterpay account to a specific register in Vend. These device details will be provided by Afterpay at the end of your training period with them, and will be sent to you in spreadsheet format with a Merchant ID, Device Name and device Secret. 6. Once you have filled out these details, click pair register. 7. Finally, click the Save Payment Type button on the top right of the page. Your Afterpay account is now linked to Vend and ready to take payments. 1. Navigate to the sell screen and process a sale as normal. 2. 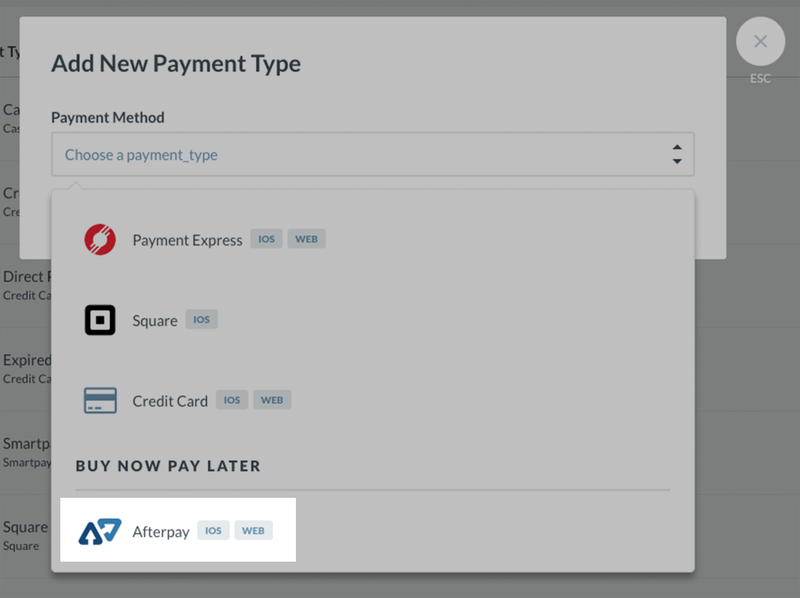 When presented with your payment options, select Afterpay. Note: You will not be able to process a split/multi payment with Afterpay when making a sale. This means your customer will not be able to make a purchase with different payment types; for example, using both Cash and Afterpay. 3. Once you have selected Afterpay, a window will appear prompting you to scan or type your customer's Afterpay barcode. At this point, your customer will need to open their Afterpay app and select the barcode tab. The customer will then present you with this barcode for you to scan or type into the window below. Once the customer's barcode has been added, click Accept and the sale will be complete! Tip: It may take time to enter your Afterpay barcode into Vend due to it's length. In order to speed up the process, we recommend using a barcode scanner. Using a barcode scanner allows you to automatically add your customer's Afterpay barcode into Vend by scanning the barcode from their Afterpay app. If you would like to learn more about Vend-supported scanners and where to buy them, click here. Important: When choosing a Vend-supported scanner make sure it is capable of both 1D and on-screen scanning. Product exchanges are disallowed for sales with Afterpay payments. You can partially refund a sale by returning a single product, but you will not be able to refund the partial price of a product paid for with Afterpay. Go to Sales History -> Process Returns -> and find the previous Afterpay sale. Select the Afterpay sale and choose Return. This will open the sale on the sell screen. Once here, click “Return” and select “Afterpay” as the payment type. This will process 100% of the amount paid to you by Afterpay and return the item to stock.